On the 5th September 1981, the Welsh group “Women for Life on Earth” arrived on Greenham Common, Berkshire, England. They marched from Cardiff with the intention of challenging, by debate, the decision to site 96 Cruise nuclear missiles there. On arrival they delivered a letter to the Base Commander which among other things stated ‘We fear for the future of all our children and for the future of the living world which is the basis of all life’. 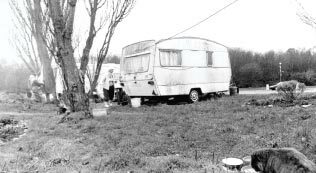 When their request for a debate was ignored they set up a Peace Camp just outside the fence surrounding RAF Greenham Common Airbase. They took the authorities by surprise and set the tone for a most audacious and lengthy protest that lasted 19years. Within 6 months the camp became known as the Women’s Peace Camp and gained recognition both nationally and internationally by drawing attention to the base with well publicised imaginitive gatherings.This unique initiative threw a spotlight on ‘Cruise’ making it a national and international political issue throughout the 80s and early 90s. 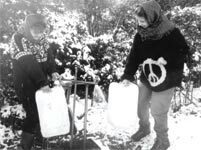 The presence of women living outside an operational nuclear base 24 hours a day, brought a new perspective to the peace movement - giving it leadership and a continuous focus. At a time when the USA and the USSR were competing for nuclear superiority in Europe, the Women’s Peace Camp on Greenham Common was seen as an edifying influence. The commitment to non-violence and non-alignment gave the protest an authority that was difficult to dismiss – journalists from almost every corner of the globe found their way to the camp and reported on the happenings and events taking place there. Living conditions were primitive. Living outside in all kinds of weather especially in the winter and rainy seasons was testing. Without electricity, telephone, running water etc, frequent evictions and vigilante attacks, life was difficult. In spite of the conditions women, from many parts of the UK and abroad, came to spend time at the camp to be part of the resistance to nuclear weapons. It was a case of giving up comfort for commitment. The protest, committed to disrupting the exercises of the USAF, was highly effective. Nuclear convoys leaving the base to practice nuclear war, were blockaded, tracked to their practice area and disrupted.Taking non-violent direct action meant that women were arrested, taken to court and sent to prison. Lecture for the BBC, referring to the Bylaws case ( won by Greenham women in the House of Lords in 1990) said ‘…it would be difficult to suggest a group whose cause and lifestyle were less likely to excite the sympathies and approval of five elderly judges. Yet it was five Law Lords who allowed the Appeal and held that the Minister had exceeded his powers in framing the byelaws so as to prevent access to common land’.